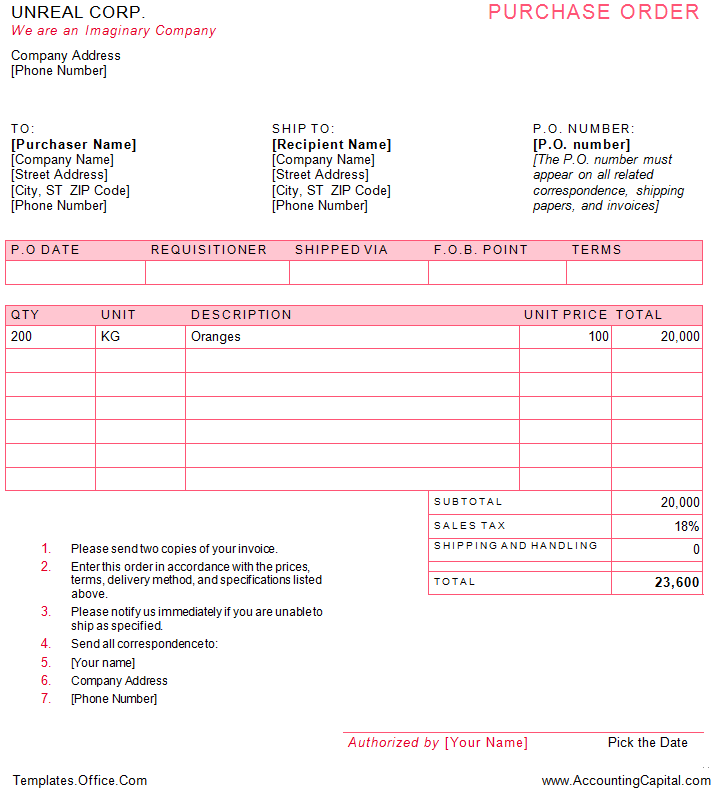 Home Other Topics What is a Purchase Order (with Template)? A purchase order (PO) is an official document generated by a buyer of goods or services as an offer for the seller; it becomes a legal document of contract once the seller accepts the purchase order. When a business wants to order goods it goes through a procurement process where it has to finalize a particular seller out of all available options and consequently has to begin a formal procedure to purchase the goods, generating a PO is among the first few steps of procurement of goods or services. There are 4 different types of purchase orders such as Standard PO, Planned PO, Blanket PO and Contract PO. Nowadays companies manage their entire procurement process with ERP systems for e.g. SAP Ariba, Oracle iProcurement, IBM Emptoris Procurement etc. Below is a modified snapshot from the linked template showing UNREAL Corp. buying 200kg Oranges at the currency value of 100/kg, the total order value including taxes is 23,600. Though a PO can look like an invoice but they are different and have their own specific purpose.